Share "Where to Place Your Fish While You Clean the Tank"
When you're cleaning your aquarium, it is best to keep your fish right in the tank. All of these steps can help make extensive cleaning less frequent. There are times, however, when it may be inevitable to move your fish, and it is important to know how to do so safely and with the least amount of stress to your tank's residents. Be gentle when catching your fish in a net, cup or bag. If they are spooked or startled, they may dart away and can injure themselves or tear their fins as they try to avoid capture. This will accentuate their stress and make the process far more threatening and difficult. Use a small bowl, mug or cup that has been thoroughly rinsed with distilled water as a temporary tank. Never place fish in containers that have been washed with soaps, as even a small amount of residue can be toxic. In a pinch, you can also use a large plastic zip bag. Use water from your existing tank to fill the temporary container. This will help fish stay adjusted and comfortable, with less shock to their delicate constitutions. This water will be returned to your tank when clean to help reestablish the proper environmental balance. Cover small containers to prevent fish from jumping out of unfamiliar surroundings. If the container does not have a lid, a simple layer of plastic wrap or setting a plate or other dish over the top of the container will suffice. Keep the temporary tank in a safe, comfortable place while you are cleaning your larger aquarium. Do not put your fish in direct sunlight or next to vents that will create dramatic temperature changes, and be sure their temporary home is safe from tips and spills. 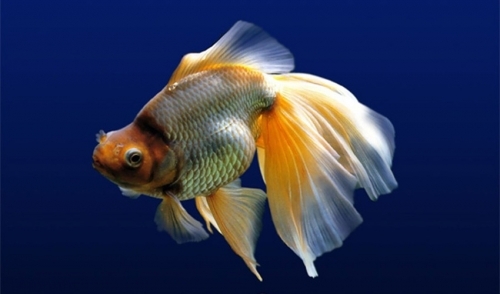 When you do have to take your fish out of their tank, be sure they are out of place for as short a time as possible. Have all your cleaning supplies ready before you remove the fish, and clean the tank as quickly as you can. It will take some time for the tank to be cleaned, refilled, conditioned and brought to the proper temperature to accept returning fish, and the faster you can return them to the tank the happier your fish will be. You should not need to remove your fish from the tank with every cleaning, but when it does become necessary to move your fish to a temporary home, it is possible to do so safely and efficiently.